A death in the family changed his life, but it didn't change his resolve to get in great shape. I have always been physically fit, but I was never muscular. Throughout high school, I stood at 5'3" and weighed somewhere around 130 pounds. I began lifting occasionally with friends during my junior year, but did not really know what I was doing and had no plan going into each session. I lived "bro science" through college and saw some gains but nothing extraordinary. By mid-2013, I stood just shy of 5'7" and weighed roughly 140 pounds. I had some muscle but I was still pretty skinny. In late summer 2013, I decided I was going to complete my first workout program. I logged on to bodybuilding.com and started to search for something that would give me results. There was one program in particular that caught my attention because it emphasized real science — it also helped with credibility that the designer was a ripped dude with a Ph.D. I downloaded Shortcut to Size and about a week later, my nitrogen-spiked protein and proprietary blend pre-workout arrived. I was still entangled in bro science but I was ready to begin my transformation. "I have cancer." Those three words turned my world upside down. The next few months were the most difficult of my entire life. Gym sessions were traded for long hospital visits as my mom fought to make it to Christmas. I was numb after she passed and I used the gym as a way to deal with the pain. I started Shortcut to Size again right at the new year, but I kept pushing and a shoulder injury sidelined me for some time. In the summer of 2014, I decided that I was going to do everything perfectly and finally reach my fitness goals. I purchased the JYM System Stack and started Shortcut to Size again. I stayed on point with my nutrition and supplementation, and in 12 weeks, I increased my weight from 143 pounds to 157 pounds. 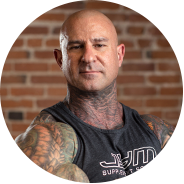 I saw huge strength increases and began to absorb everything I could from Dr. Jim Stoppani's videos and articles. I continued with Shortcut to Size several times before branching out to other JYM programs. My transformation has taken four years. At age 23, I weighed 143 pounds with 13 percent body fat. Now at age 27, I weigh 160 pounds with 8 percent body fat. I am not special. My fitness journey has had its ups and downs just like everybody else. The key to my transformation has been consistently acting on the right information over time, and for that I credit JYM Supplement Science. I am very grateful for the countless hours Dr. Stoppani has devoted to educating consumers. I owe my progress to him and the JYM brand. There is no other company I would entrust my health to and no other company delivering such impressive results to so many other ordinary people.